Building your own home is a popular way of acquiring a property in Portugal. Many plots are available but, due to restrictions introduced in the early 1990s, planning permission is usually only granted where a piece of land has an existing dwelling or ruin; or is within an established urban area with mains services, i.e. water, electricity and drainage. Another option is to buy an older property in your preferred location, then renovate or completely rebuild to your own taste and requirements. Similar planning permission is required should you completely change or extend a property, or add a pool. Planning permission is obtained from the Camara de Municipal (town hall), normally by an architect. In any building project it is essential to use experienced professionals / architects who understand the local environment, the legal and planning requirements, to ensure the project runs smoothly to successful completion. The process begins with planning permission and drawings; then proceeds through construction and complete project management until key-handover. When you obtain a building licence, it's essential to choose the right construction company for the project: one with a good record and reputation in the same kind of building, and preferably in the same local area. You should ask to see similar projects that they have completed. Most construction companies are able to offer all types of building work, whether a brand new home, a refurbishment, extension or complete renovation. Ideally you should obtain estimates from several companies and have the contract drawn up by your lawyer. All property in Portugal must be constructed to withstand an earthquake measuring 7 on the Richter scale. You should also ensure that it is built with a damp-proof course and cavity insulation. Check that all roofs have sufficient fall / pitch to ensure that rainwater runs off quickly. Portuguese law requires that a registered engineer must be employed to supervise any building contract. On completion the Camara must issue a habitation licence, having checked that the property was built in full accordance with the project, before you can legally move into or sell the property. We have many beautiful plots of land available for construction, varying in size and types of location throughout the Algarve, with sea or country views or facing a golf course. It's also common nowadays to buy a plot from an established developer, who will then build the villa to your specification, all the way to final landscaping, pool etc. This is known as a 'turnkey' project. If you're interested in building your own home, just ask Yellow Homes. 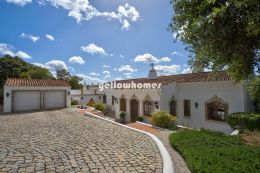 We can advise and help recommend the best partners to build your Algarve dream home.